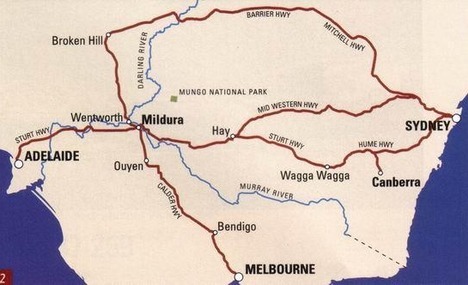 Broken Hill is located near the border with South Australia on the crossing of the Barrier Highway and the Silver City Highway, in the Barrier Range. It is 220 m (722 ft) above sea level, has an average rainfall of 235 mm (9 in) and summer temperatures that reach well over 40 Â°C (104 Â°F). The closest major city is Adelaide, the capital of South Australia, which is more than 500 km to the southwest. Broken Hill has been called "The Silver City", the "Oasis of the West", and the "Capital of the Outback". Although over 1,100 km west of Sydney and surrounded by semi-desert, the town has colourful park and garden displays and offers a number of attractions such as the Living Desert Sculptures. The RASP Mine is located centrally within the City of Broken Hill Underground development activities were suspended in June 2008 with the significant fall in commodity prices and subsequent global financial crisis. Following the takeover of CBH Resources Limited by Toho Zinc Co., Ltd.in 2010, the development of the RASP Mine became a priority and by January 2011 development approval from the NSW Department of Planning had been obtained. Underground development recommenced in April 2011 and continues on schedule. Activities are focused on the underground development and mining of the Western Mineralisation and Centenary Mineralisation along with the high grade pillars left unmined from the Main Lode Orebody. The RASP Mine was officially opened on 25 July 2012, commissioning of the plant has now been completed and commercial rates of production are now being achieved. Annual production is planned to average 34,000 tonnes of zinc metal in concentrate, 28,000 tonnes of lead metal in concentrate, and 1.1 million ounces of silver in the lead concentrate. Rasp mine will have a mine life in excess of 15 years.